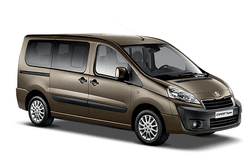 With a huge cargo area, a spacious interior, smart looks, good value, surprisingly good mileage rates, capable of seating nine, economical engines, and advanced power and drive options, it is no wonder the Peugeot Expert is one of the leading super seater vans out there. With enough room for nine and all their luggage or other cargo needs, this is one of the most popular vans we have in stock and is a big hit with renters in the area! You can enjoy advanced safety features and custom luxury options that make the ride even more enjoyable. Check it out today and see why the Peugeot Experts is a popular choice for car rentals in the area today and see first-hand what it can do for your transportation needs!